If this summer you have grown your first Potato, Carrot, Raspberry, Tomato or Plum then welcome to the Grow Your Own club. It feels good doesn’t it? Sowing, planting, raising, feeding, staking, maybe pest and disease deterring, battles with the elements and this year we’ve had them all, there is nothing quite like the satisfaction of serving up a portion of home-produce tended by your own fair hands. Growing edibles is perhaps one of the sharpest learning curves we can take on board, yet despite the highs and lows of the process and whatever the outcome, it is a great feeling. These ‘skills’ and believe me I think we can use the word with authority may be passed on to other members of the family our children and grandchildren. This summer we set some local schools two tasks - to grow the largest sunflower flower head and the heaviest and most decorated pumpkin. These two challenges will hopefully engage children and teachers in the common pursuit of nurturing the growth of plants as well as a greater understanding of what plants need to succeed. We look forward to seeing their results at our Apple and Honey Show Weekend on the 23rd and 24th September. If you want to learn more about the theory of good seasonal garden practise then a reminder about our next Autumn Essentials in the Garden Workshop, with Clare Price. Hands-on topics to be covered include seasonal pruning advice, propagation from pruning material, seed collection and storage and top tips on planting bare-root trees, fruit and shrubs. See HERE. Enjoy your late summer garden - whatever the weather! THE BIG BULB PLANT It is always exciting when the 2018 Bulb of the Year is announced in the garden trade and this year it is Allium cristophii - a corker of a bulb. This gigantic headed ornamental onion produces silvery lilac blooms on a stocky 35cm stem making it ideal for pride of place at the front of the border or as a magnificent cut flower. 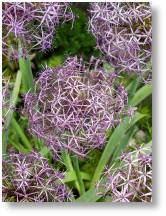 This Allium flowers in May and June and lasts for many weeks. We are entering the new bulb season now and the great thing about planting bulbs is that anyone can do it – even the most inexperienced or novice gardener can get involved. Planting bulbs is a cheap and cost effective way of getting lots of fabulous colour into your garden from early in the year right through Summer. Bulbs are pretty hardy and will return every year, not only that they are pretty clever things as well! They will stay under ground so you don’t need to worry about them, even in winter, as they will be quite happy in the soil until ready to grow at the right time. D on’t be frightened to plant lots of different bulbs in one small area. Bulbs grow at different rates and times, so by planting lots of different bulbs in the same area, you can almost be guaranteed new and colourful flowers right through the season. T his is the perfect time of year to plant your bulbs for next Spring while the soil is still warm. You can either plant straight into the soil, which many people do, or plant into containers – this way you wont forget where you’ve planted your bulbs and accidentally dig them up when taking out bedding plants that have finished flowering for the season. If planting in containers, simply plant them into the soil in Spring when they are ready. The general rule of thumb when planting bulbs is to dig them in twice the depth of soil to the size of the bulb so if your bulb is 5cm high, dig a hole 10cm deep. Pop your bulb in and cover up. Your clever bulb will do the rest! We stock both long handled and traditional hand bulb planters (pictured left Crest Garden Wooden Handled Bulb Planter £2.99). THE COVER UP JOB Your garden furniture and BBQ's will benefit from a protective cover as winter approaches. We offer a wide range of plastic covers for 2,3 and 4 seater traditional benches, hammocks, swing seats, small bistro covers for both round and square sets, larger 4-6 seater dinning sets (round and rectangular) as well as covers for stacking chairs. Please ask instore and we will find you the best cover option. If you have a Weber BBQ look out for our range of heavy duty Premium covers. These will help prolong the life of your BBQ by protecting all year round against the weather and dirt and debris. And don’t forget outdoor taps! Before the temperature plummets, invest in a tap insulating cover to help keep frost out of vulnerable pipe work. PLANNING AHEAD There is still time get a few 1st and 2nd early potatoes established in pots for a useful crop of new potatoes for Christmas. Recommended varieties to plant include ‘Duke of York’, ‘Maris Peer’ and ‘Charlotte’. We also have available the plastic poly potato bags - perfect for establishing a single tuber per pot. The Levington’s Original Potting Compost would be our recommended medium for growing them in. You’ll see we have the first displays of Christmas gift range food, including favourites from Mrs Bridges, Cottage Delight, Bon Bons, Churchill Confectionary and Fatherson Bakery - these will be located in our Food Hall. If you are planning ahead gift wise then keep an eye out for our 2018 range of calendars covering themes from nature to past times, pets to football clubs and natural scenes to pop icons. These calendars and wall planners are already on display in the Gift Area of the Shop. 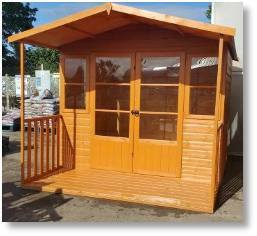 NEW GARDEN BUILDINGS SUPPLIER We are pleased to announce we will be selling a range of outdoor garden buildings from Shire. All Shire buildings are produced to the highest standards using quality materials from sustainable sources. 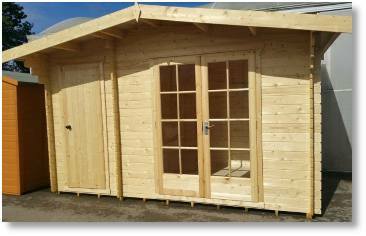 The company imports timber direct from Russia and Scandinavia where it is slow grown and only the best grades are used. Shire plane, machine and cut the timber themselves and construct panels on site so they are able to control quality from start to finish. 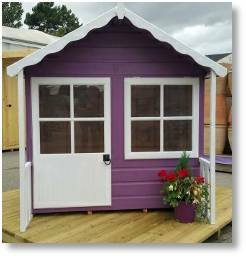 This Lincolnshire based company offers a great range of well made, good value for money buildings from sheds, garden buildings, pine lodges, tool sheds, bike stores and playhouses. Please come and have a look at our display of models, including ‘Bourne’ Log Cabin (pictured below left, untreated wood), ‘Milton’ Summerhouse (pictured below right), ‘Lewis’ Apex Shed and ‘Kitty’ Playhouse (bottom middle). Shire’s extensive range also includes Tool and Bike Store. The average turnaround for orders is four weeks, plus a week for assembly, if required, needs to be added on. For more details and prices, please ask one of the Shop Team. You need to be quick off the mark to get the most and best from early flowering bulbs suitable for winter forcing, says Chris Day. I love to have bulbs growing indoors ready to bloom around Christmas time, but even before the flowers arrive, there’s something very naturalistic and simple about those little green shoots and they look beautiful when displayed in a pretty container. My favourites - and I have a few - would have to be Narcissus ‘Paper White’ (pictured below) but I often find these quite difficult to procure. They’re no doubt very popular, with their miniature white clusters and delicate perfume which is simply perfect later in the year. The traditional method is to plant the bulbs in boxes, preferably in well-draining bulb fibre, then put them outside in a sheltered corner and cover them in sand to cut out the light. A more modern method is to plant the bulbs in bulb fibre in the pot they will be displayed in then put them in a black plastic bag and keep them in a dark shed or basement. Either way the bulbs need to be out in the cold to trigger root growth for up to 10 weeks, although Narcissus ‘Paper White’ may be ready after four to six weeks. Make sure they don’t dry out completely, and when you are nearing the 10-week mark check on their progress to make sure they are close to sprouting leaves. Then bring them inside at the beginning of December, starting them off in a cool room so it is not too much of a shock to the system and putting them back in a cooler room if they look like they are going to peak too soon. If you have gone for the old-fashioned method of growing them in boxes or modules and covering them with sand, you can put them into their final pots when you bring them in. You don’t have to limit yourself to Christmas bulbs: start a new pot of bulbs off every two or three weeks and you will have spring-scented rooms in the depths of winter. Good contenders include Crocus, Muscaria (pictured right) and small flowered Tulips and these all available in the Shop. More strongly-scented are hyacinths. These are very easy to come by, and if you’re planting them indoors be sure to buy those which have been prepared for this (bulbs for indoor forcing have been cold-treated in advance so they think it’s now time to start producing flowers). This year, I’ll be growing hyacinths in bulb vases. It’s really easy: just put each one in a bulb vase (ensure the base of the bulb isn’t quite touching the water), pop them in a cool and dark place (mine are in a kitchen cupboard) and leave them until the green shoots appear at the top of the bulb. The roots will grow downwards into the water – this can be changed every week or so to keep it fresh. Once the green shoots come, you can move the bulbs somewhere a bit warmer - ideally a north-facing window - for them to bloom. Continue to change the water periodically, and to turn the container so the plants don’t lean over in one direction. Our borders have taken quite a battering this summer from unseasonally blowy winds, torrential downpours on to dry soils and mercury busting temperatures. The late show of border colour comes from a wide and varied palette of plants, however the trio of plants to generally see us through the next couple of months or longer are Asters, Japanese Anemones and Sedums. Asters have been flowering since July and many will continue right through until October. Popular varieties to go for include ‘Little Pink Beauty’ smothered in soft pink flowers only 30cm tall, ‘Mönch’ grows 90cm tall with yellow centred lavender-blue flowers, pictured and the Island series Asters, including ‘Barbados’, ‘Samoa’ and ‘Tonga’. 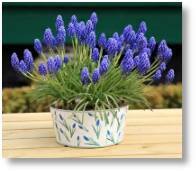 These are ultra compact and perfect for pots and borders with good mildew resistance too! When it comes to growing stately Japanese Anemones then a little shade and a moisture retaining soil favours them best, especially if you want a long show of colour. They sulk if they get dry, often with the edges of the leaves blackening, so adhere to their cultural conditions well. We have a good range of popular varieties in our catalogue range of plants, all grown in 9cm pots so they get away without check and form a decent clump relatively quickly. Good doers include ‘Honorine Jobert’ (white single flowers with bright yellow anthers), ‘Profusion’ (purple-pink, semi-double flowers.) 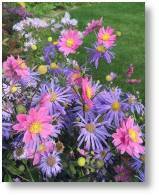 and ‘Queen Charlotte’ (clear pink semi-double flowers, pictured left with Aster ‘Mönch’). ear as they come into their own. At the Garden Centre we often associate them with Echinacea and Rudbeckia to give you that prairie style planting combination. Tried and trusted grasses to look out for include Festuca, Pennisetum and Stipa. One of the best for impact is Miscanthus sinensis ‘Zebrinus', a beautiful fountainous grass that takes its name from the horizontal cream bands on the leaves. It is for this wonderful foliage that this striking grass is grown, but it may also produce silky, finger-like flower spikes in late summer. oot plants quickly to ensure a great display next spring. Wallflowers are remarkably resilient plants being in the cabbage family. However, avoid planting them in areas where cabbage root fly, flea beetle or mealy aphids have been a problem. They like good drainage and suffer badly if they sit all winter in wet ground so it would be useful to add extra grit to our Buckingham clay. Although they are very hardy it is a good idea to pinch out the growing tips when you plant them to create bushy plants and to get rid of any very late, vigorous growth that may be hit by early frosts. It is a mistake to over-feed the soil, which will only make for this late spurt of growth and you should never give wallflowers any fertiliser apart from Bonemeal. The named single colours and mixed tall/compact wallflowers varieties will be here shortly and don’t forget under planting with Tulips works particularly well with them. PUZZLE CORNER - UP FOR A LATE SUMMER CHALLENGE? Would you like to win a £25 Buckingham Garden Centre Gift Voucher? Enter our crossword competition below. Use the clues to fill in the answers. Take the letters from the shaded boxes which form an anagram of a popular summer flowering shrub. 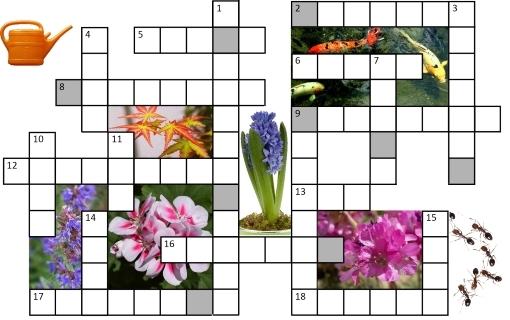 Once you have solved the anagram, send the plant name you have discovered by e-mail to competitions@buckingham-nurseries.co.uk with subject line “September crossword” or post your entry to September Crossword Competition, Buckingham Garden Centre, Tingewick Road, Buckingham, MK18 4AE. Closing date 30th September 2017. The answers to the last newsletter’s crossword are available HERE. 13. Roots, Tubers, Rhizomes, Corns and _ _ _ _ _ (5) ? Congratulations to Clare Poil from Tingewick who was the winner of the £25 Garden Centre voucher for getting the answer correct. Will you help me give the gift of an active future to people like Mark? Since having a stroke, Mark misses going to work and struggles to come to terms with his disability. He also grieves for his father who passed away in 2010. 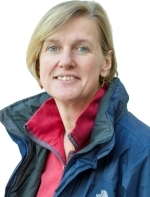 I’m Aggie Michalec and I have been a horticultural therapist for over 2 years. I combined my experience of therapy and support work with the gardening skills I gained growing up on a farm and completed a Diploma in Social and Therapeutic Horticulture with Thrive in 2014, shortly after which I started working at the THRIVE Trunkwell Garden Project in Reading. I recently finished Level 2 in Practical Horticulture and the new knowledge I have gained will help me to support the clients at THRIVE in their gardening journey. Mark attends a core therapy session with me once a week and is a quiet member of the group but enjoys being part of the team - watching and listening and participating when drawn into conversation. He has a fun sense of humour and enjoys some banter and a joke. 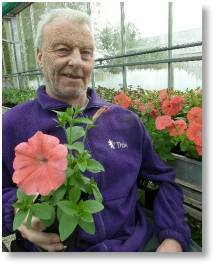 Mark has limited mobility, using a wheelchair for most of the day and requires 1:1 support. Access to certain parts of the garden can be challenging as can using tools one-handed from the wheelchair. Despite this he never complains and is always willing to join in and help other people. Gardening with Thrive gives Mark the opportunity to be active, exercising both body and mind by taking part in purposeful activity – he still misses his job as a florist which he lost after the stroke. Mark is particularly proud of his own garden plot and enjoys working on this throughout the year. This metre square raised bed has recently been rebuilt for him by the group, raising the height of the sides to enable better access for him to work from a seated position. This means a new chapter for Mark this growing season. He has chosen to grow salad and potatoes and has painted the outside in fresh new colours. Cooking is something that Mark is very keen to learn and he was really pleased with the results of baking with me a few weeks ago. He only needed a little help and took the rest home after having some with his lunch. Thrive’s new fully accessible kitchen, funded by a generous legacy, will offer more opportunities for Mark to practice independent living skills, making his own drinks and preparing his lunch, using the produce from his plot and Thrive’s allotment. He should also be able to spend some time out of his wheelchair, transferring onto a chair and walking short distances. Mark also enjoys being able to use his creative skills when the group do gardening related art and craft activities and has set himself a goal to do some flower arranging. Gardening at Thrive offers Mark the chance to socialise and he appreciates spending time with people rather than being on his own. He also appreciates how people treat him, seeing the person and not the disability. Will you donate today so that more people like Mark can have a meaningful future? With your support, we are using gardening to help people to grow stronger and healthier in body and mind. While in London, you will see endless people heading down from the streets into the warren that is the London Underground system. But if you want to avoid the hustle and bustle of the trains and the busy streets, there are some hidden gems to be found if you go UP the stairs instead! 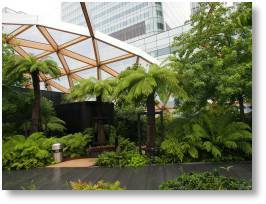 In this article, Trevor Bradley takes a look at one of London’s newest Roof Gardens at Canary Wharf. As part of the new Crossrail project, the largest construction project of its kind in Europe linking Reading in the West to Shenfield in the East, a new station for the ‘Elizabeth Line’ (as it is to be known) has been built at Canary Wharf. Above the station, the area has been transformed into a 300 metre covered roof garden, called Crossrail Place. The whole garden is encased in a wooden framework and large triangular plastic bubbles giving the area a very futuristic look. rading ships docking in London. From the Canary Wharf underground station, the garden is a little hard to find. Leaving the station you are immediately aware of where you are. Right in the heart of London’s financial district ‘jungle’. Tall, imposing buildings tower above you in every direction, but on finding the roof garden entrance and ascending the escalator, you are transferred to a light and airy oasis of calm. The length of the roof garden is split into two halves, East and West. Display boards throughout the garden help you look for and identify the plants from each region. Pathways lead you through the centre, but on your return you have to try the paths off to the left and right so as not to miss any of the plants on view. Some of the plant highlights on the Eastern side include Japanese Maple (Acer palmatum), Black Bamboo (Phyllostachys nigra), Veitch Bamboo (Sasa veitchii) and Northern Japanese Magnolia (Magnolia kobus). And on the Western side of the roof garden, highlights include Soft Tree Fern (Dicksonia antartica), Golden Tree Fern (Dicksonia fibrosa), New Zealand Tree Fern (Dicksonia squarrosa), Strawberry Tree (Arbutus unedo), Sweet Gum (Liquidambar styraciflua) and Bird of Paradise (Strelitzia regina, pictured left). 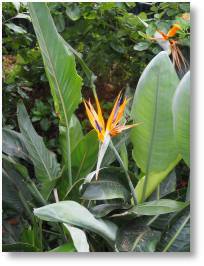 Both sides have many other specimens too including some very exotic flowering plants. Walking from the East side to the West side does really make you feel like you have crossed the Meridian line and moved from one hemisphere to the other. To add to the tranquility of the gardens, each end has a performance area where the general public can do a ‘stand up’ if the mood takes them. While visiting, an Oriental gentleman with a fantastic voice was singing in his native language in the Eastern end of the garden which was very atmospheric while standing amongst Japanese Maples and Bamboos. And in the Western end another gentleman was playing the piano placed there for the general public to ‘tinkle the ivories’ and entertain their fellow visitors. You can easily spend an hour in the roof garden and there is plenty of seating and rest areas where you can just sit and spend 10 or 15 minutes or however long you want just taking in the gardens. And if you are feeling hungry, there are food and drink outlets at each end. The gardens are free to enter and are open until 9pm or until sunset in the Summer. 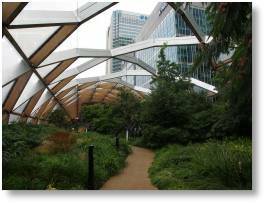 If you are in the Canary Wharf area of London the garden is well worth a visit. Next time….. What hidden gem lies behind a door down this unassuming looking back street off London’s busy Kensington High Street? Throughout 2017 we will be donating 10p for every Herb plant we sell in our standard 9cm and one-litre pots to THRIVE, our chosen charity of 2017. We are hoping for one last push for them as we enter late summer and early autumn - traditionally a good time to establish new herb plots or perhaps re-vamp herb planters and baskets before the winter. Congratulations to Mrs Allen, pictured middle left who won the THRIVE Meat Raffle. 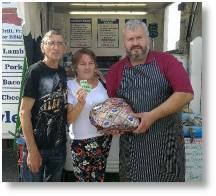 Our Sunday Butcher, Lee Crawley, left, presented the £40 Meat voucher prize. We are delighted to announce the introduction of Mr Fothergill’s Seeds to our range in our Shop. If you are unfamiliar with the name or the brand here is some useful background information about the Company. You’ll find a great choice of varieties in the Mr Fothergill’s range as it prides itself on offering something to appeal to everyone. Every year the range is reviewed and new lines added to complement the popular established favourites. 20 new varieties have been added for the new season. Look out for Verbena ‘Scentsation’, discovered on Mr Fothergill’s own trail grounds by the trials manager and then bred over 6 years. This lovely verbena is compact with super-scented flowers in white, mauve, pink and blue. Other notable flower additions include; Sweet Pea ‘Lady Salisbury’, a lovely scented white and cream mix with subtly coloured picotee blooms. Calendula ‘Orange Flash’ is a new dwarf variety with uniquely bicoloured double flowers. Within the vegetables you’ll find two new chilli Peppers; Pepper ‘Curry Pepper’ said to be the chilli for Indian curries and Pepper ‘Havana Gold’, bred to have the great flavour of a Habanero but with half the heat. A major new addition to the Mr Fothergill’s seed range is the Royal Horticultural Society (RHS) Award of Garden Merit (AGM) range of seeds. These are separate to the standard Mr Fothergill’s seeds and offer an extra choice of 61 flowers and 56 vegetable seeds. The entire range (pictured right) has been selected from the RHS’s AGM list of tried and tested varieties giving gardeners assurance that they will be growing truly garden worthy plants. erminate better in less favourable conditions compared with untreated seed. Species offered in this range include; Carrots, Parsnips, Lettuce and Parsley. 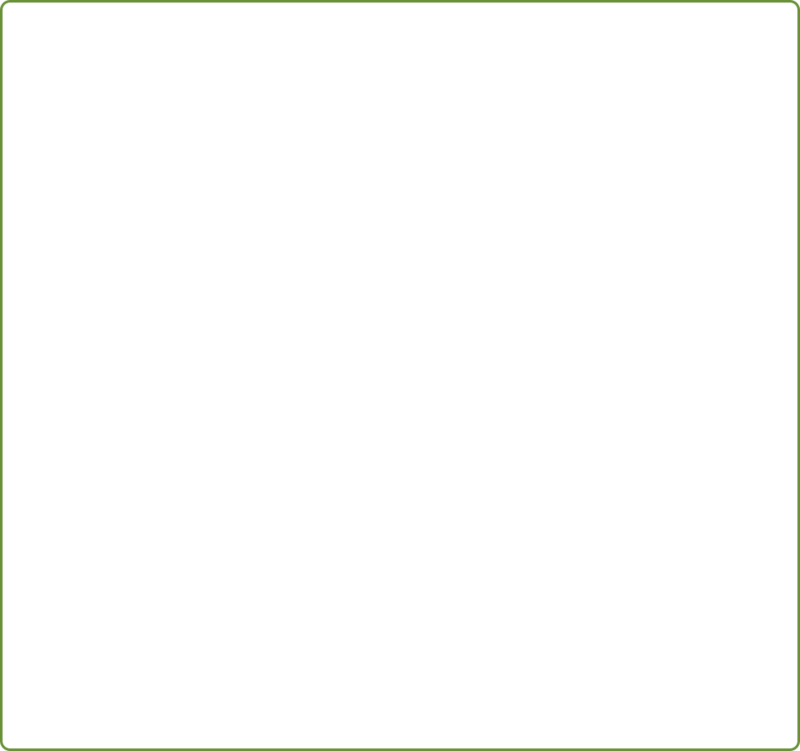 Optigrow seeds will be available from January 2018. 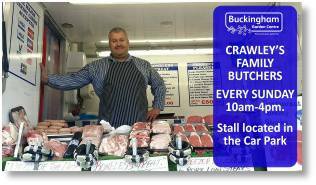 EVERY SUNDAY Between 10am-4pm you can stock up on your fresh vegetables and fruit and also purchase a superb range of competitively priced fresh meat and poultry from Lee of Crawley’s Family Butchers from Brickhill. WEDNESDAY 13th SEPTEMBER A talk - ‘25 Years of The Parks Trust in Milton Keynes’. Dudley James charts the development of the Parks Trusts charity and how it was set up to care for the parks and public open green spaces of Milton Keynes. From concrete cows to (real) sheep, ancient woodlands to newly created parkland, this charity cares for over 5,000 acres of green space, equating to 25% of the total area of Milton Keynes. All our talks are in the Talks Room in the Restaurant, at 4pm, and will last approx 45 minutes with time for questions afterwards. To book a seat call us on 01280 822133. Garden Club Members free, £3 for non-members. 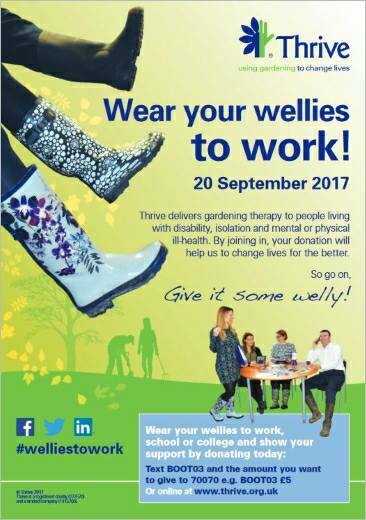 WEDNESDAY 20th SEPTEMBER THRIVE Wear Your Wellies to Work. See page 9. 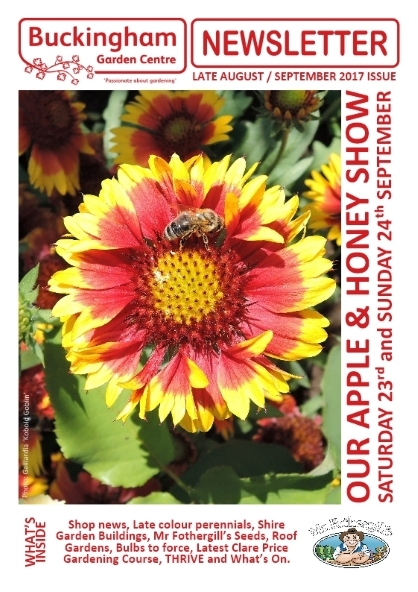 SATURDAY 23rd & SUNDAY 24th SEPTEMBER Apple and Honey Show Weekend. Top RHS fruit expert Gerry Edwards and Moulton College’s Fritz De Zutter will be joining us over this celebration weekend of the apple. Of course, the Mid Shires Orchard Group will be there too, milling and pressing apples for juice, advising on local varieties of orchard fruit and running the 'longest peel' competition! They will also demonstrate the work they do to care for our county's historic orchards and fruit trees and explain how you can join in and lend a hand with this important and enjoyable conservation work. The local Beekeeping Group will be holding their annual show on the Sunday. We will also be inviting the local schools,who entered our Pumpkin and the largest Sunflower Challenges, in on the Saturday for judging. WEDNESDAY 4th OCTOBER, 9.30-12.30pm Autumn Essentials Workshop with Clare Price. What to do in the garden as we move from Autumn into Winter? Whilst plants are dormant there are still plenty of useful jobs to be getting on with to prepare and enhance your garden for the following season. This Workshop covers three of the essentials to get you on your way. An introduction to Autumn and Winter pruning to include Apples/Pears, shrubs and roses. An exploration of plants to propagate including using some of the pruning material - Cornus, Roses, Phlox, Acanthus and division of perennials - Astrantia, Geraniums, plus seed collection and storage. Bare Root planting of trees and shrubs in time for the bare root season. The course will be part demo and part practical so please bring along suitable clothing, footwear, gloves and sharp secateurs. Cost of course is £15 for Garden Club Members, £20 for non-members. Booking is essential on 01280 822133 as spaces are limited. WEDNESDAY 11th OCTOBER BGC’s Chris Day brings you his new talk on Re-Inventing The Border. Smaller gardens means a different perspective on the types of plants you can grow as Chris looks at the possibilities as well as tips of keeping the interest and colour coming through the whole year. See Wednesday 13th September for details of how to book and the location of the event. THURSDAY 12th OCTOBER Garden visit to Batsford Arboretum & Bourton House Garden. For details and to book call our Customer Service Desk on 01280 822133.